This is a very attractive ski hat with a brim that folds up and back. It fits a bit like a 20s cloche and looks fantastic in dark colors. I’ve made it in purple and a heathery light blue, and I think the purple is best (but alas, that one is a gift…. C6F: place first 3 stitches of cable on a double pointed needle and hold them in front of the work. Knit next three stitches as normal, then knit the three stitches off dpn. C6B: same as C6F, but hold the three stitches behind the work instead. Cast On 80 stitches onto circular needle, join without twisting stitches, place marker at beginning of round. Purl one round, decreasing 8 stitches evenly spaced to 72 stitches. and weave-in ends. 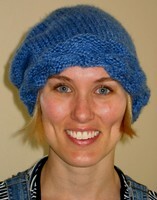 Now, push purled portion of hat up through cabled brim, adjust and wear! Beautiful, isn’t it?